For Day 2 we’re getting a little fancy. Pinwheels will always make people ooh and aah; these are the pretty cookies you put on top of the box to show off. For this one, I took half of the dough and added some baking spices – cinnamon, cloves, allspice and a touch of salt – and made a pretty light brown spiral. Pinwheels are not all that difficult but they do require some attention to detail. For the best results, you need to dig out that ruler from the junk drawer. If you want to be really precise, use your scale too. This is a tough one to eyeball. For successful swirls, all you really do is take two sheets of dough of equal size and thickness, slap them together and roll the whole thing up into one long swirly sausage. Because I find getting even thickness on a thin sheet of dough the hardest part, I use my scale to divide the dough evenly. I know that if I roll out two pieces of dough of equal weight to the same dimensions, chances are really good the thickness of both pieces are going to be pretty even. Math. Make sense? Now the rolling part. If you’ve ever made sushi, you’ve got this. If you haven’t, no biggie, there are few things to keep in mind. One, use parchment paper. It’s your friend. Two, if the dough is too cold it will crack while rolling so make sure it’s slightly cool but pliable. Three, for nice clean cuts make sure your dough logs are firmly chilled, use a thin, sharp knife and give the log a ¼ turn after every cut to prevent getting a flat side. Also know that the first cut or so from each side will be a little wonky. Treats for the baker. 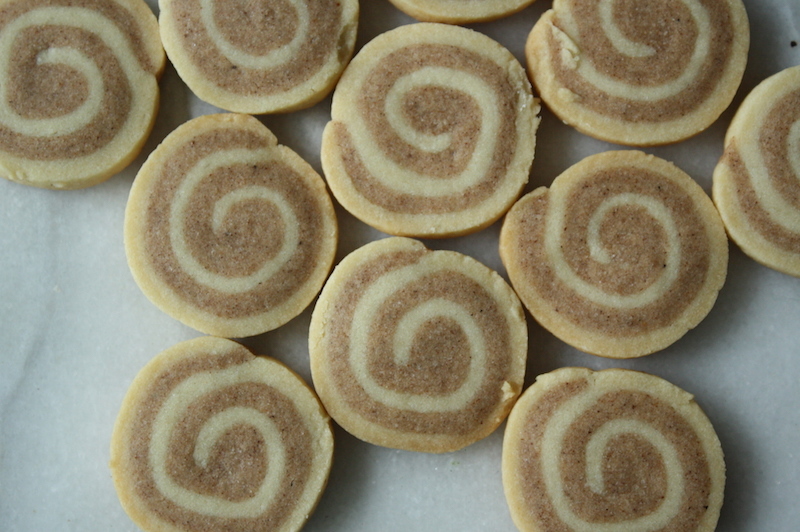 Side bar: I tried to find a good You Tube video on rolling sushi to help you visualize how to roll these when it occurred to me after watching 30 minutes of bad sushi videos that I should just look for rolling pinwheel cookie videos. Duh. So I found this Lolly woman and she does quite a nice job of it in about 70 seconds. So if you need a visual, check it out. And here’s an out if attention to detail is just not your thing and/or one of your rolls goes a bit off the rails: marbled cookies. Gently knead those two doughs together, just enough to get it all to adhere together, roll into logs then chill and cut as directed. You’ll have lovely marbled cookies and no one needs to know. STRESS THERAPY BAKING FACTOR: HYPNOTIC. I could stare at these swirls all damn day long. They mesmerize and delight me to no end. Cutting into the log – because you just don’t really know until you get to that point – is the most satisfying thing. Go for it. For the dough: divide the basic butter cookie dough in half (use a scale if you’re an exacting kind of person.) Wrap half in plastic wrap and set aside until needed. Add the other half of the dough to a standing mixer fitted with the paddle attachment and add the remaining ingredients – cinnamon, nutmeg, cloves, salt. Mix on medium until well blended and no butter dough streaks remain. To shape the cookies: Place a piece of parchment paper on your work surface and dust it lightly with flour. Lay one piece of plain dough on the parchment paper, flour the top to prevent sticking and roll into a 6 ½” x 10 ¼” rectangle, squaring up the edges and corners. Set aside. 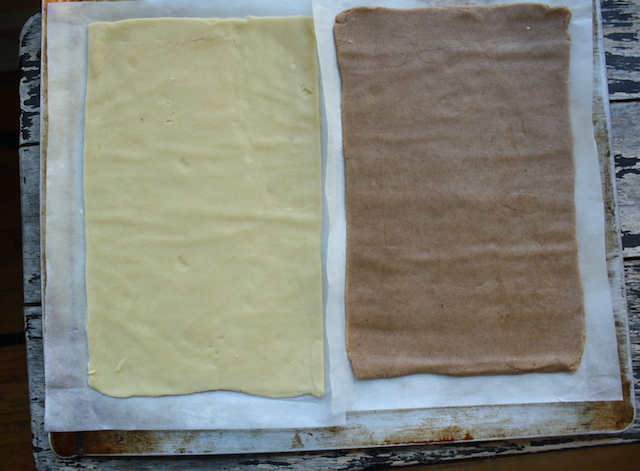 On another sheet of floured parchment, roll the cinnamon dough to the same size – a 6 ½” x 10 ¼” rectangle. Place the cinnamon dough evenly on top of plain dough, lining up the edges/corners then carefully laying the dough down. With the flat of your hand, rub/press the top dough sheet down together to adhere to the bottom sheet. 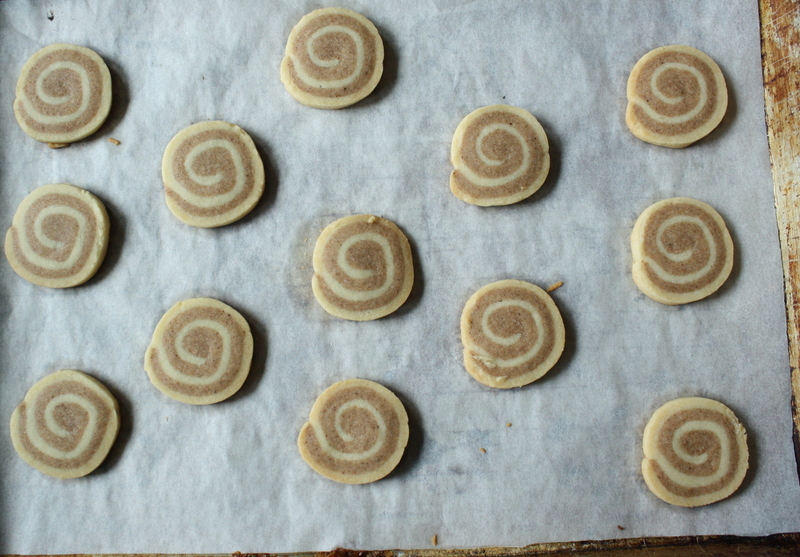 Decide if you want plain or cinnamon dough to be the outer ring of the pinwheel. Whichever you decide, make sure that dough is on the bottom then peel off the top sheet of parchment and discard. Roll the log back and forth in the parchment to firm everything up nicely then cut the log in half and wrap each piece tightly in plastic wrap. Refrigerate. If you’re working with a larger batch size, continue the process with the remaining pieces of dough. 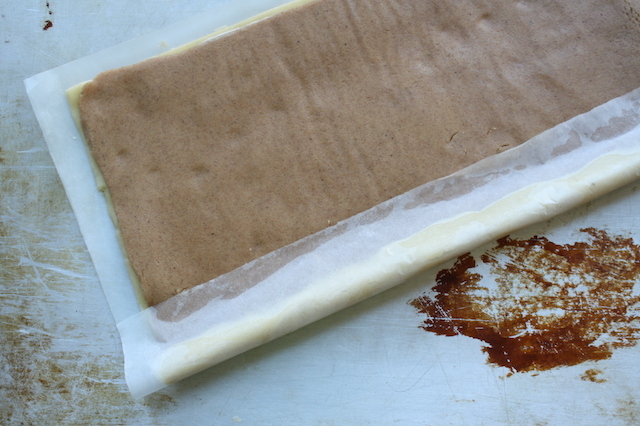 Refrigerate the dough logs for 1 hour until firm (or freeze up to 3 months). to cut/bake: place the sugar in a small bowl for dipping. Remove one log from the refrigerator, unwrap, and place on a clean cutting board. With a sharp, thin knife, gently cut the log into ¼” slices, rotating the log regularly to keep it round and avoid a flat/smooshed side. If the dough becomes too soft to handle, place it in the freezer for a few minutes. Dip one side of the cookie in the sugar and place, sugar side up, on the prepared sheet pans. Repeat with the remaining log(s). Bake for 12-14 minutes, rotating the pans halfway through baking, until they feel firm to the touch and are lightly golden on the bottoms. When cool, store airtight at room temperature for several days. 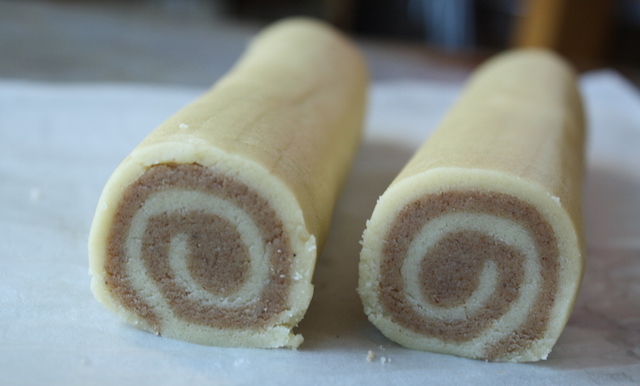 Do ahead: The dough logs can be made ahead and frozen for up to 3 months. Let defrost overnight in the refrigerator.